In May 2004, she gave an interview to Huanita Dragicevic for Radio “Mir” Medjugorje. Huanita Dragićević: Mrs Traun, Praised be Jesus Christ, and welcome again to Medjugorje! In the beginning of our interview, I would like to ask you to be so kind to tell us something about yourself. You are Felicia of Abensperg and Traun, and this is certainly very interesting for our readers! It is different. Some don’t live their faith, some do, but apparently every day less and less. When you come to Medjugorje, there is more and more faith! Everything is encouraging you to become stronger in faith. You feel Our Lady’s messages in your heart and you want to live them. If you don’t live them, you do nothing good for God. When I go away from Medjugorje, I try to meditate and to live Our Lady’s messages, and with the help of God, I try to bring them closer to the hearts of people that surround me. Some are interested in it and they come with me, others don’t. I feel nevertheless that I have to try to make them know these messages; all that I do, I want to do it for the greater glory of God. My children and my grandchildren are a gift and a blessing of God for me. When they were younger, all my children came with me to Medjugorje and they were all very impressed. They have their own lives now, but I have a great desire – and I pray for it – that, one day, we all come to Medjugorje together again. We are a big family, but I hope that God will fulfil my desire before I go to Heaven, and that we still have time. If this comes true, it would be the greatest performance of my life. My husband was a man of great faith, and he came with me on pilgrimage to Medjugorje. When I invited him to come, he said: “How could I refuse you?”, and he came. Although he had a deep faith, it was difficult for him to pray. 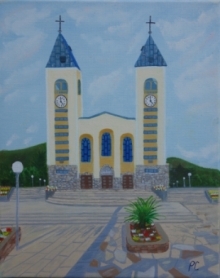 But when he came to Medjugorje, he spent all his time in the church. While I went to the mountains and to the visionaries, he was in the church and it was not easy to take him away. That pilgrimage has changed our lives, our way of seeing things, our life as a couple. How has this friendship begun? We know that – together with him – you have done so much for our people, especially in Konjic. Our friendship began in a very unusual way. Before I knew him, I used to know Fr. Slavko very well, who came to visit us often in Austria. This friendship with Fr. Svetozar was really in God’s Providence… It was in the eighties, on a very warm day of August. I wanted to go to the church to refresh myself, and there, I heard a priest talking to English speaking pilgrims. I felt a voice within me telling me: “Felicia, go and ask this priest what he needs!” The voice was very persistent, so I stood up and went towards him, but there were so many people around him, in front of the altar! A friend of mine asked me: “What are you doing! ?” I answered that I had to speak to this priest. It was quite incredible: our eyes met, he came towards me and took me to the sacristy; the visionary Marija was also there. He offered a chair to me, thinking that I wanted to make a confession. He asked me: “Who are you? Do you need something? Do you want to make a confession?” I answered: “No, Father, maybe tomorrow, not now; I came to ask you if you need something!! ?” He looked at me, very surprised, and he asked me to repeat what I said. I said: “I have the feeling that you need something very badly!” Then, he joined his hands and kept on repeating: “This is incredible! This is incredible! You see, I have no passport and I cannot travel, and I have a great desire to build a church in Konjic, so that people from six villages may go for Mass. Can you help me? Do you know people who could help me?” I answered: “Yes, Father, I am travelling very much and I know people. We will do what you are asking. I don’t know how, but I know that we will do it.” And so it was. The church is there. I was present on the day of its consecration, only two days before the wedding of my daughter. I remember that we were dancing together, the people and the Franciscans. I also remember that people from other religions were there. It was an experience that I will never, never forget! This is wonderful, but this is not all… you have also offered a big golden monstrance for St. James’ church in Medjugorje. This was another inspiration from God. It is not I; I have just a little part in this great work. It was in 2000. I met Fr. Svet, he invited me for a cup of coffee, and I said that there must be something else, not just a cup of coffee. During three years, in Medjugorje, I was only crying, praying to God and resting in the presence of Our Lady. Then I felt that Our Lady has enrolled me into her army, and that I have to work for her. When I accepted that cup of coffee with Fr. Svet, I knew that - sooner or later - he would ask me something, and that’s how it was! He told me that he loves the Spanish sacred art, and that he would like to offer to St. James’ church a big monstrance, so that thousands of people who are coming to pray in Medjugorje in summer may see Jesus from far. He asked me if I knew somebody who could do it. I answered: “You are asking a lot from me. I don’t know right now, but if you are asking, it will be so. Let me think about it.” And he said: “Think until tomorrow, and come to see me tomorrow evening at eight.” The next day, I was climbing the Cross Mountain with a group of young people. All the time, I was praying to God to inspire me and to show me how to do it. Coming down from Cross Mountain, I hurt my leg. One of the young people from our group – his name is Angel – helped me to come down the hill. It took us two hours instead of one. As we were walking, he was talking about himself and about his life, and all of a sudden, he said to me: “I know that you have to meet Fr. Svet tonight. I wanted to tell you that I am an architect, so if I can help you…” “Yes, Angel, you are really an angel! Come with me tonight.” Fr. Svet was very excited! He took us both by the hand, into the church, literally running, he closed all the doors, we knelt in front of the altar - all three of us - and we prayed: “May dear God and Our Lady give us the strength and the inspiration to realise this!” Fr. Svetozar and Angel understood each other perfectly, and only six months later, the Magna Monstrance was made! It was built by two brothers according to the design of our Angel who did a wonderful work, although before that, he never worked on a religious project. But the big miracle still had to happen: Angel met the captain of the Spanish unit of the UN-soldiers in Bosnia and Herzegovina, and he asked him an advice: how to transport the big and heavy monstrance to Medjugorje. The captain answered that it would be an honour for him to do it personally! So, the monstrance came to Medjugorje in the aircraft of the captain. We also came to Medjugorje, and in our presence, Fr. Svet received it. It was really incredible! I have nothing to say. My message is the message of Our Lady. Do what Our Lady is asking from us, because her messages are coming from God. I would also like to share with you my experience with Mother Teresa from Calcutta. I had the honour to meet her and to know her personally. I was with her in Vienna and I had with me some blessed medals from Medjugorje. She gave me some Miraculous Medals from Paris, Rue de Bac, and I asked her: “May I give you a medal from Medjugorje? Have you heard about Medjugorje?” And she answered: “O my child, do I know about Medjugorje? Off course I know about Medjugorje! I would like to go there!” “So, why aren’t you going?”, I asked her. And she answered: “You see, I cannot go before the Holy Father goes! But I believe in Medjugorje.” Let me also add, that I know, that our Pope has recommended to many priests and faithful to go to Medjugorje, because he believes in Medjugorje. He cannot disbelieve in Medjugorje, because it is a place of prayer and great fruits, and this is the most important.